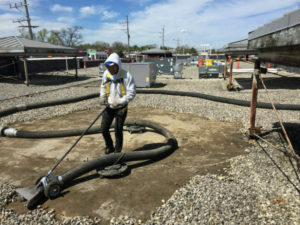 Chicago Roof Ballast Removal | Velocity Roof Vac Service Inc. Working with other roofing companies together to get the job done. "We are the safest crew around," says Manuel, a veteran with the company and job foreman. Material left on the roof can be worked around; if the job has to start early or is behind schedule, we'll help pick up the pace. We serve the entire Chicago Metropolitan area and surrounding towns Chicago areas. We are a premier commercial and industrial roof vac services company with a fresh face on the globe looking to service your next big job. We work together with your crews and other vendors to help move the job along in a swift, productive and safe manner. Velocity Roof Vac Services specializes in roof preparation and removal of gravel, rocks and other stones on any roof in need of repairs or construction of a new roof. Our high powered Vac Loader vacuums various wet or dry materials, such as cement pea gravel, dust and river rock with a conveyance of 600 ft. Our system eliminates most manual labor, shoveling, hoisting, and multiple handling associated with other systems and is dust free. 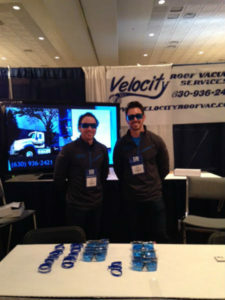 The Velocity team of vacuum operators can save you time and money guaranteed, and our equipment is proven safe and a sure way for any roof vac services to be completed. Less manual labor means lower workmen compensation cost, which means more money in your pocket. We also provide our personal roll off truck for easy access to dumpsters and removing the ballast from the job site to a recycling center or location of your choice. 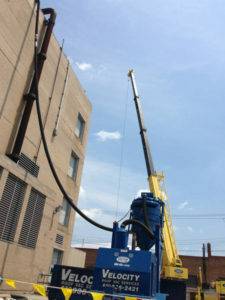 Vac will pull all the stone, debris and anything else that doesn’t belong up on your roof, then Mack will take it away.